Could Lane Kiffin be joining Nick Saban's staff at Alabama? 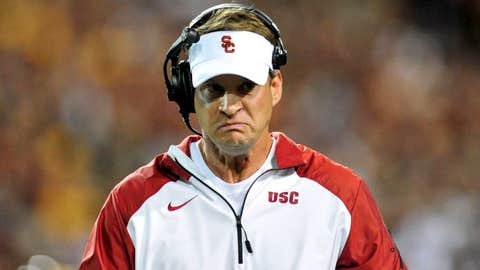 The start of the new year may be a great one for Lane Kiffin. The former USC head coach, fired in late September and replaced by interim Ed Orgeron, is interviewing for the open Alabama offensive coordinator position as early as Thursday. Greg Couch of FOXSports.com confirmed the report. The Crimson Tide post was vacated when Doug Nussmeier took the same job at Michigan on Wednesday. Kiffin, a combined 35-21 as a head coach at USC and Tennessee, visited Nick Saban and Co. as an observer during preparation for the Sugar Bowl.